Pharmaceutical giant Ranbaxy Laboratories Ltd's Rs 107 crore expansion plan in Himachal Pradesh's Sirmour district has become a bitter pill the company's being made to swallow. Farmers' suspicions, indeed outright distrust, have placed the company's initiative to expand the capacity of an existing plant at Ganguwala, Paonta Sahib, under a cloud. And on July 28, 2004, district deputy commissioner M L Sharma stopped the construction of a formulation plant at village Bata Mandi after an inspection at the site revealed town and country planning department rules had been flouted. Sharma took the step in response to a July 21, 2004, Simla High Court order on a petition filed by Bata Mandi farmers. A bench consisting of chief justice V K Gupta and judge M R Verma required the deputy commissioner to inquire if the construction contravened rules: "After satisfying himself that the said construction activity is being carried out in contravention of any such law, rules or regulation on the subject, he shall ensure that such construction activity is stopped forthwith and with immediate effect," the order said. "The maps of the construction site were yet to be approved by the competent authority," explains Sharma. "So we stopped construction immediately, as ordered by the honorable court." Timely expansion At the Ganguwala plant, Ranbaxy has been manufacturing Lovastatin and Pravastatin -- these inhibit the activity of an enzyme known as 3-hydroxy-3-methylglutaryl coenzyme. Since this enzyme regulates cholesterol production, blocking it results in less cholesterol being produced by the body -- for more than a decade now. This year, it wished to increase production capacity there to 15 times more than the current 8 tonnes, and set up a new formulation plant at Bata Mandi, costing respectively Rs 87 crore and Rs 20 crore. Such expansion was, as Ramesh Parekh, the director of the plant at Paonta Complex, explains, "Keeping in mind the coming competition in the statin drugs market after January 2005 because of India's commitment to wto (World Trade Organisation) to adopt the product patent policy." Statins -- so-called because each drug in this category has a name that ends in 'statin' -- are slated to emerge from the shadow of patents; any company with a greater ability to produce it would immediately become more competitive in the global market. So the expansion is good thinking, from the company's perspective. But ask Paonta Sahib and Bata Mandi farmers, and they shake their heads in absolute unison. They fear: less water According to Mahesh C Juneja, senior manager at the Ganguwala plant, about 70,000 litres of water per day is required to run the plant. He says the company has permission to extract this much water, from the Himachal Pradesh Pollution Control Board. But people in surrounding villages claim the plant guzzles more than 100,000 litres every day. In any case, the water table all around has fallen. Consider village Kedarpur. The main crop cultivated here is rice, a water-intensive crop. Says Gopi Chand, a 50-year-old farmer, "Four to five years ago, one could get water at a depth of 15-17 metres. Now I have bored to a depth of 35 metres, and even am getting only 1.5 inch of water with a bore of 7 inches." He laments: "I have invested more than Rs 10,000 on the rice crop in twenty bighas of my land. I am not anticipating anything this season. All my efforts and money have gone in vain." Other Kedarpur villagers, and people in Ganguwala and Bhatanwali villages, echo Gopi Chand's words; their primary apprehension is: the 800,000 litres per day of water the expanded plant would require, and what that would do to a diminishing water table. Precisely such a fear is one reason the Bata Mandi farmers filed their petition against the construction of the formulation plant. Says C M Madhur, chief secretary of Resident' Welfare and Environment Protection Society, Paonata Sahib, "According to papers Ranbaxy submitted before [a July 28] public hearing, if the proposed expansion takes place, the solid waste and liquid effluent will respectively increase from 150-200 kilogrammes per day to 6000-6500 kg per day, and 50,000 litres per day to 700,000 litres per day." This is no ordinary effluent. Madhur warns: "It comes out of the fermentation process (used to manufacture statins). It will have lots of biological ingredients which cannot be trapped by a simple sewage treatment plant and are very harmful for the area, as the plant is surrounded by prime agricultural land." Parekh pooh-poohs such apprehensions. "We will be using soybean oil and milk as raw material for the fermentation process. So it is not as typical or hazardous as it is being projected by some people. This process of manufacturing will be as simple as making curd from milk." But K K Tripathi, adviser/scientist, department of biotechnology, Union ministry of science and technology, differs. "No fermentation process is as simple as making curd from milk," he says. "If they are using soybean oil and milk as raw materials then it is bio-transformation, a basic fermentation. Even so, the effluent from the manufacturing process will contain dangerous bio-agents." But Parekh remains confident: "As far as treatment of effluent is concerned, all the guidelines decided by the state pollution control board will be taken care of." This doesn't convince villagers. They believe all the waste management techniques being explained by Ranbaxy are but a fiction to get clearances for the expansion. "They discharged all the effluent in the Yamuna and dumped the solid waste in the open area near the riverbed. But when the talks about expansion started, just two-three days before the public hearing, people from Ranbaxy came and took some of solid waste from dumping sites in trucks and burnt the rest to destroy the evidences", says Yashpal, president of Bhatanwali panchayat, pointing to one of the sites used to dump the solid waste. Farmers in the vicinity of the Ganguwala plant also say they were not provided with a copy of the environmental impact assessment (eia) at a June 28 public hearing the company arranged as part of the clearing process for expansion (any project above Rs 50 crore requires a public hearing, to obtain a no objection certificate). When Down To Earth contacted C Joshi, environment engineer at Paonta Sahib, to see the eia report, he refused to show it, despite having a copy with him. This correspondent subsequently contacted the deputy commissioner, who ordered the report to be handed over. But when this correspondent visited the office again, the engineer had proceeded on leave. Moreover, both plans -- the one for expansion and the new one at Bata Mandi -- flout regulations. The development plan for Paonta Sahib, prepared by the town and country planning department of the government of Himachal Pradesh, categorically suggests that no further expansion in terms of area or capacity should be permitted in respect of the unit. The upcoming unit at Bata Mandi, for which construction is already on, is violating state pollution control board rules: in its siting criteria, it is specifically mentioned that prime agricultural land shall not be covered by industrial units. As of now, the file for the Ganguwala plant has been forwarded to the state pollution control board for clearances. 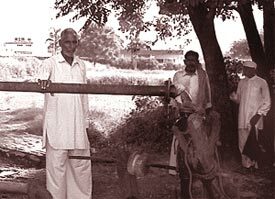 The Bata Mandi farmers are clearly more proactive; that's because some farmers there were literate. This is not the case of the Ganguwala farmers. They face a future in the shape of a question: what if the state and Union governments give the go-ahead?